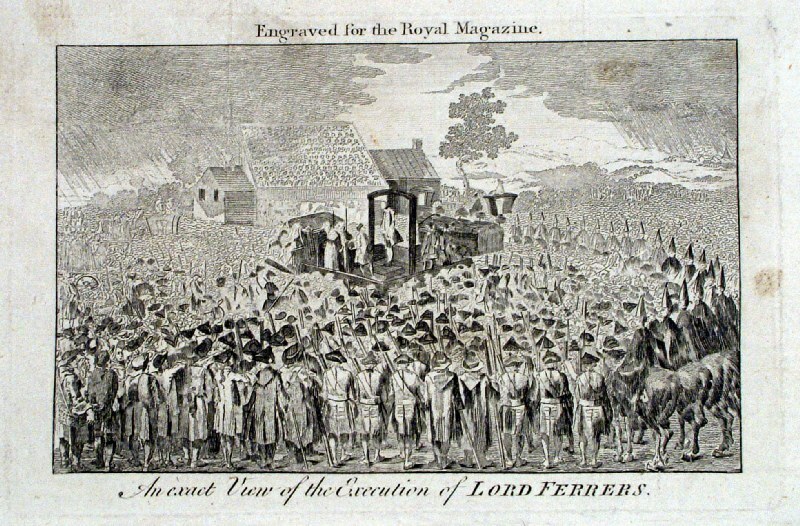 On this date in 1760, Laurence Shirley, 4th Earl Ferrers became the last member of the House of Lords to hang. A violent-tempered man — madness was said to run in the family, and this was in fact the Earl’s defense at this trial — Ferrers’ nastiness ran his wife right out of the house. 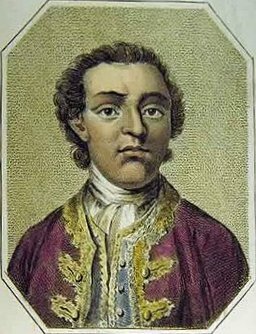 Consider this was the 18th century, he must have been some kind of intolerable. Some oysters had been sent from London, which not proving good, his lordship directed one of the servants to swear that the carrier had changed them; but the servant declining to take such an oath, the earl flew on him in a rage, stabbed him in the breast with a knife, cut his head with a candlestick and kicked him on the groin with such severity, that he was incapable of a retention of urine for several years afterwards. We’ve seen in these pages how a certain sort of ill-humored man would sooner go to the scaffold than subsidize his ex. Ferrers was this sort. The arrangement for the Ferrers spouses (they weren’t divorced, just separated) was that Ferrers would pay her support via his old household steward. Chafing at the payments and resenting the middleman, Ferrers one day in January summoned him to his, theatrically accused him of breaking faith, and shot him through the chest. The Earl was tried before the House of Lords (a jury of his peers, and Peers! ),* but his sentence was straight from the Old Bailey: not just hanging, but anatomization. However, his exalted rank did draw a few odd perquisites. 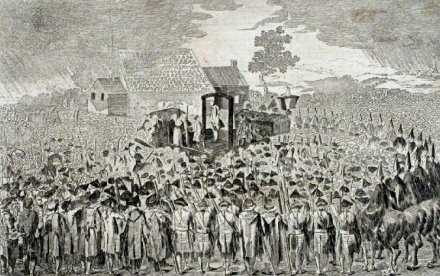 Most noticeably, perhaps, was the fact that Ferrers was allegedly hanged with a rope of silk, rather than hemp. For only the softest coiling around noble throats, you see. The other, and in hindsight more consequential, was that he didn’t get the low-rent treatment of being shoved off a cart. Instead, the scaffold was surmounted with a small platform supporting a set of trap doors whose opening would suspend the malefactor for his asphyxiatory journey to the hereafter. This innovation presents us an obvious forebear of the now-familiar “drop” method of hanging which evolved over the subsequent centuries. 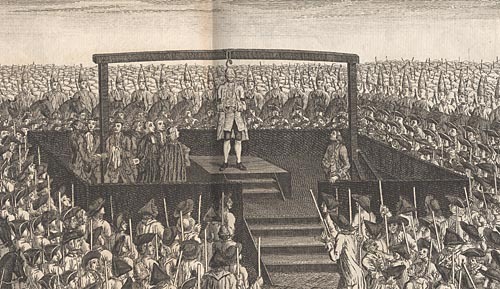 Though the drop was not repeated at Tyburn, it became wholesale practice when hangings moved to Newgate Gaol; the drop itself thereafter became the very art of the hanging when it was lengthened and scientifically measured to snap the neck of the condemned on the fall instead of strangling him or her. And you could trace it all back to May 5, 1760. To judge from other engravings, this red-letter day did not want for witnesses. 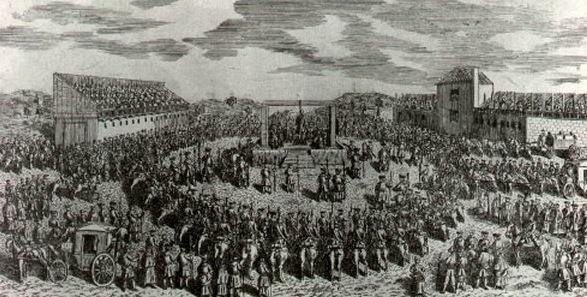 Perhaps stage-frightened by all these eyeballs on their noteworthy prey, the executioners put on an amateur-hour show. They openly fought over the £5 tip Ferrers gave (he accidentally handed it to an assistant), and likewise again over the rope that conducted the sentence. When next in London, wet your whistle at Streatham’s The Earl Ferrers, a local pub. Ferrers also asked to be hanged with a silken cord, instead of a hemp rope, as befitted his rank. This request, too, was denied.